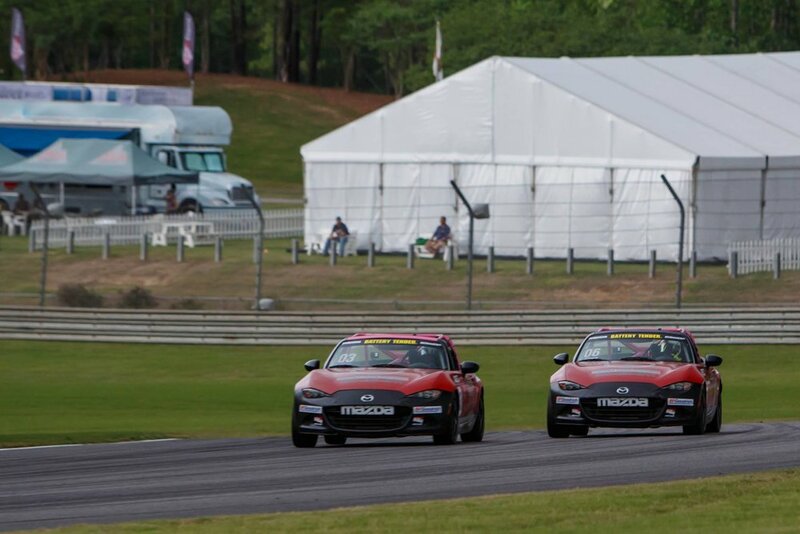 Well, we finally finished Rounds 1 & 2 of the Global MX-5 Cup series at Barber Motorsports Park. & It was AWESOME! We started the weekend off on a good foot. During practice, Patrick and I were on pace to be in Top 15 with scrubs on. For Qualifying, we slapped some stickers on the cars and BAM... we qualified 22 and 24... NOT what we wanted. While qualifying, Patrick's O2 sensor failed and he was loosing HP while we were drafting and on my fast lap. Unfortunately, he had to pit and I couldn't get another fast lap out before the short session was over. Come Race Day, we were both pretty mad about qualifying. But thankfully the Long Road Racing guys helped us out on fixing Patrick's car and had us back on pace. Our goal was to move forward, we didn't care how far, we just knew we were better than 22 and 24! Race 1, Patrick had an AMAZING start and ended up finishing in 8th PLACE!! Yes, 8th PLACE! The GB Racing - Racing Analytics team was so proud of him. He ended up winning the Hard Charger award for passing 16 cars, 16!! I, on the other hand, finished 14th. Still super proud of myself for making a comeback from 22nd place because it was a tough race making up the positions that I did. Race 2, We both started around the same positions that we did in Race 1. Both of us had a pretty bad start but we didn't let that stop us. Myself and Patrick brought it up well within the Top 15. I finished 12th and Patrick finished 13th.. we came across the finish line together and both cars were in one piece.